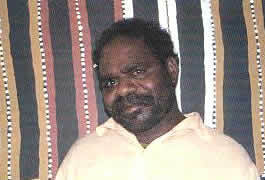 Walala Tjapaltjarri is a Pintupi man who was born in the early 1960s at Marua, east of Kiwirrkurra in the Gibson Desert. He is married to a Warlpiri woman and travels between his homeland of Kiwirrkura and his wife’s country of Yuendumu and Alice Springs. As well as the acrylic paintings for which he is now internationally famous, Walala has collaborated with members of the Campfire Group in Brisbane to produce a series of unusual steel sculptures. This was their first contact with European society. Their emergence from the desert, in a region which was thought no longer to have any traditional owners still living a nomadic way of life, caused great national and international interest. Walala started painting two years later producing classic Tingari images. He was introduced to painting by his brother Warlimpirrnga, also a well known artist. In a short time however he developed his own distinctive style and imagery to depict country and ceremony. The subject of his work is the Tingari Cycle which are secret song cycles sacred to initiated men. The Tingari are Dreamtime Beings who travelled across the landscape performing ceremonies to create and shape the country associated with Dreaming sites. The Tingari ancestors gathered at these sites for Maliera (initiation) ceremonies. The sites take the form of, and are located at, significant rockholes, sand hills, sacred mountains and water soakages in the Gibson Desert. These Dreaming sites and songs are depicted in the traditional ochre colours of the desert. By 1996 his painting his style had evolved to the works he continues to paint, characterised by rectangular shapes with surrounding dots and a limited palette of up to four colours. He first started exhibiting his work in 1997 (in the 14th National Aboriginal and Torres Strait Islander Art Award, Darwin) and he has been involved with a number of group exhibitions since, as well as having several solo shows. His paintings are represented in private and public collections in Australia, Europe and the USA.